A teenage driver operating a motor vehicle with a blood alcohol level of .08 percent is approximately 17 times more likely to be involved in a car accident, according to the U.S. Center for Disease Control and Prevention. Research has shown that teenagers, as a group, are more likely to be susceptible to peer pressure, are more inexperienced, and are more likely to engage in risky driving behaviors. When intoxicants such as drugs or alcohol are added to the mix, the risk of causing a car accident significantly increases. The CDC has stated that reducing the risk of drunk driving accidents caused by teenagers should not only be dependent upon local law enforcement, state, and federal enforcement measures, but it should also be the responsibility of parents, schools, and communities as well. In 2014, a study illustrated how great the impact of peer pressure can have on influencing teenagers to drink and drive. According to researchers, when high school seniors saw their friends drive while intoxicated, they were more inclined to do the same. Similarly, when their friends engaged in risky behaviors, many teenagers viewed these behaviors as “cool” and desired to act in the same manner. 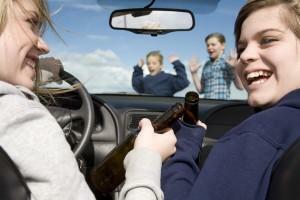 If you are the parent of a teenage driver, it is important to understand that not all kids drink for social reasons. Many teenagers drink alcohol for one purpose alone: to get “buzzed.” Therefore, expecting your teenager to attend a party, responsibly drink alcohol, and then stop when he or she reaches his or her limit is highly unrealistic. According to statistics, binge drinking is more popular among teenagers than any other category of drivers and, as such, teenagers may be more likely to continue to drink past their level of comfort. As a parent, consider setting firm rules about underage drinking in the home. It is often unwise to present alcohol to your teenager or his or her friends if they are under 21 years of age in an effort to appear “cool.” Some parents believe that if they provide alcohol in the comfort of their own home, they can monitor what happens and ensure the safety of their child. However, in many cases, giving your teenager alcohol may simply open the doors to binge drinking at parties and other social situations for which you may not be present. You could also risk civil liability and criminal charges should your child’s friend become involved in a drunk driving accident since U.S. law forbids adults from providing alcohol to a minor. Additionally, it is also important to have an open relationship with your teenager. Let your child know that if he or she attends a party and needs a ride home, it is always okay to call you rather than travel with a friend who has been drinking. You may also consider leading by example and refrain from driving your car while intoxicated. Do You Have Questions about Drinking and Driving? If you or someone you love has been injured in an accident involving a drunk driver and you would like to learn more about your legal rights, Van Sant Law, can help. We can provide you with a free case evaluation and help you to determine if you have a valid case. Our experienced attorneys understand how difficult and emotionally devastating drunk driving accidents can be, particularly since these incidents are entirely preventable. Call us today at (678) 679-6710 to learn more about filing a lawsuit against the responsible party and recovering damages for your injuries.